One punch that will last for eternity in UFC lore unraveled a decade of dominance and a year of buildup. Conor McGregor knocked Jose Aldo out cold in one of the biggest fights in UFC history Saturday night at the MGM Grand Garden Arena. And he did it immediately. McGregor’s second punch was a counter left hand that connected right on Aldo’s chin to end the Brazilian’s 18-fight winning streak 13 seconds into their featherweight championship bout. McGregor commended his longtime rival after notching the fastest-ever finish in a UFC title fight but also celebrated with some of his standard brashness. He climbed to the top of the cage and faked shuffling money out of his hands. He also jigged out of the arena to his usual walkout song, “I’m Shipping Up To Boston” by the Dropkick Murphys, while his partisan crowd of fans with Irish flags danced right along. “Ireland, we did it,” were McGregor’s final words to the crowd. Aldo said he remembered the entire sequence, but he was clearly unconscious from the strike. He asked for an immediate rematch, but that seems like a long shot given the decisive finish and with former lightweight champion Frankie Edgar in line for an opportunity. 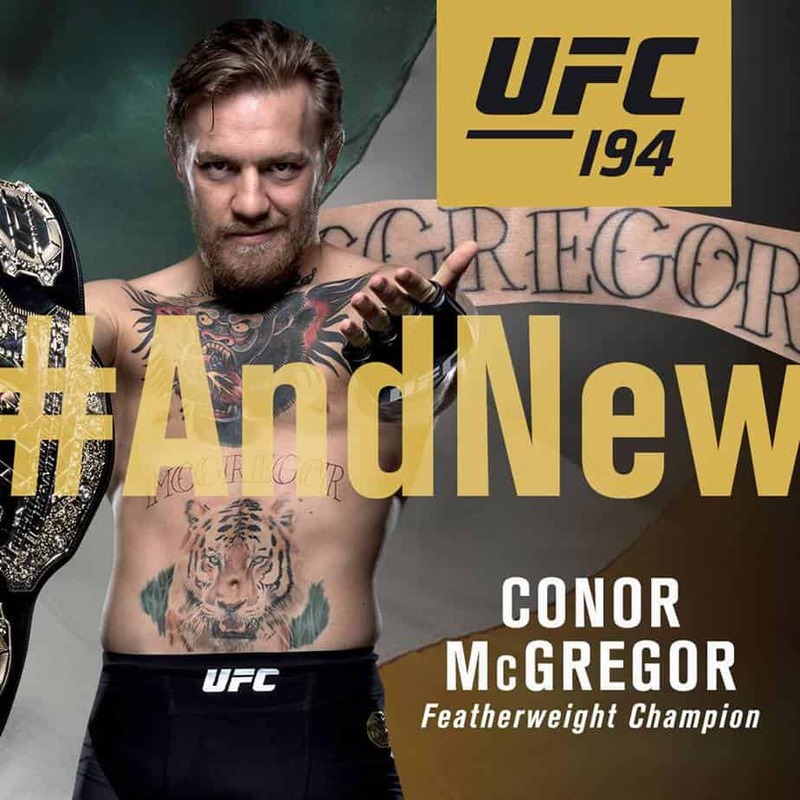 McGregor’s interim championship belt, which he won against Chad Mendes when injury pulled Aldo out of their bout when it was scheduled this summer, turned into the undisputed title. He’s the first man aside from Aldo to ever hold it. He wasn’t the only new champion. McGregor closed as the slight underdog just like Luke Rockhold in the co-main event middleweight championship. But Rockhold manhandled previously undefeated Chris Weidman, winning via TKO at 3:12 of the fourth round. Rockhold tore Weidman’s face apart with a brutal ground-and-pound. Referee Herb Dean, who probably made a major error by not stopping it late in the third as Rockhold was whaling away on Weidman with fists and elbows, finally called it at 3:12 of the fourth to give Rockhold the middleweight title in the co-main event of UFC 194 at the MGM Grand Garden. Arguably the best pure athlete in the UFC, Rockhold backed up his pre-fight claims of victory with a sensational performance. “I can’t even believe this is real right now,” Rockhold said. He joins Cormier, the reigning light heavyweight champion, as active UFC champions. Velasquez lost his heavyweight title in June but will rematch Fabricio Werdum for the belt in February in Las Vegas. Weidman had a strong opening to the fight, but late in the first round, as they were grappling on the ground, Rockhold caught Weidman in a guillotine and squeezed it hard for the last minute, though Weidman survived. The turning point came in the third when Weidman tried a wheel kick. Rockhold caught it and grappled Weidman to the ground, the first time in his UFC career that Weidman was taken down. Rockhold got mount and delivered vicious ground-and-pound. Dean allowed it to go on, giving Weidman every chance to survive and try to retain his title. Rockhold’s first title defense will come against Yoel Romero, who defeated Ronaldo “Jacare” Souza by split decision (29-27, 29-28, 28-29) in the closest bout of the night. Romero nearly knocked out Souza in the first and held on for the victory. McGregor’s teammate Gunnar Nelson didn’t have such a memorable night. The welterweight managed hardly any offense in getting out-grappled by Demian Maia, who earned a unanimous decision (30-26, 30-26, 30-25). Max Holloway won an eighth straight fight to close in on a second opportunity at McGregor, beating Jeremy Stephens by unanimous decision (30-27, 30-27, 29-28) in the pay-per-view opening featherweight bout. Holloway previously gave McGregor the closest fight of his UFC career. McGregor notched by far his most emphatic victory Saturday night.